Home » Threatened Species » How Far Can Birds Fly Without Needing to Land? How Far Can Birds Fly Without Needing to Land? Advances in technology are allowing us to learn more and more about how birds can travel huge distances under their own power. Not long ago, tracking equipment was so heavy that it would weigh birds down. Now, very light GPS tracking equipment – less than 1.5 grams – can be used to track birds without hampering their flights. Biologist who fitted GPS trackers to the aptly named wandering albatross have found that these large birds can travel at least 15,000 km (just under 10,000 miles) over the sea before returning to land. That’s like flying non-stop from Houston, Texas to Perth, Australia. Many commercial jets cannot do that! Even more amazingly, the wandering albatross seems to be able to stay in the skies above its Southern Ocean habitat for as long as it wants to, only needing to flap its wings every few hours. And what amazing wings they are – at a span of 3.5 meters, (11.5 feet) – the wandering albatross’s wings are the longest of any bird currently on Earth. 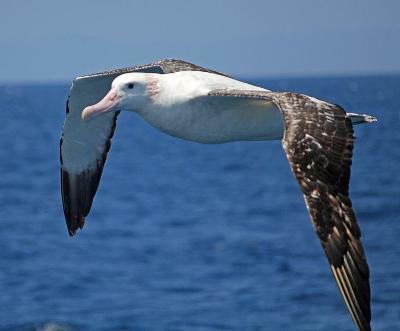 The albatross flies so efficiently that it uses less energy in flight than when it’s sitting on dry land! A wandering albatross above the ocean. Image by Charlie Westerinen. Albatrosses soar with amazing prowess over the Southern Ocean using a flying technique called dynamic soaring. Dynamic soaring allows albatrosses to tap into the energy of the wind, and can be used when the wind speed is higher than 30 km per hour, or 18 mph – which it usually is. In 1873, the French write Jules Verne wrote his famous novel in which Phileas Fogg of London, attempts, against all odds, to get Around the World in Eighty Days. With the opening of a new railway in India, a newspaper makes the claim that it should be possible to make a complete circuit of Earth in eighty days. Fogg accepts the challenge, and after many adventures, succeeds by the skin of his teeth. Of course, the challenge would not have been a problem for an albatross. In fact, a gray-headed albatross was recorded making a complete circuit of our planet in just 46 days. We now know that the wandering albatross only comes to dry land when it’s time to breed. Once a chick leaves the nest, it may stay at sea for as long as five years. Albatrosses are long-lived birds, and can live to more than 60 years of age. Sadly, their numbers are declining because of long-line fishing boats. Baited lines up to 130 km (80 miles) in length are pulled behind boats. The albatrosses are attracted to the bait, then get caught on the lines and drowned. The wandering albatross was first recorded by the Swedish botanist and zoologist Carl Linnaeus in 1758. Linnaeus also gave the bird its Latin name, Diomedea exulans.